#201 5th Jul 2018 at 2:12 AM Last edited by gummilutt : 5th Jul 2018 at 5:17 PM. Contest put me in a build mood so I decided to build a play-along for this round. I usually build from nothing, but this time I happened upon a house shell I liked and I decided to use it as base The room layout is loosely based on the house my cousins grew up in. The building is what us Swedes call parhus, which translates to coupled-houses. The only common wall is through the garage, so even though they are attached you get some privacy. 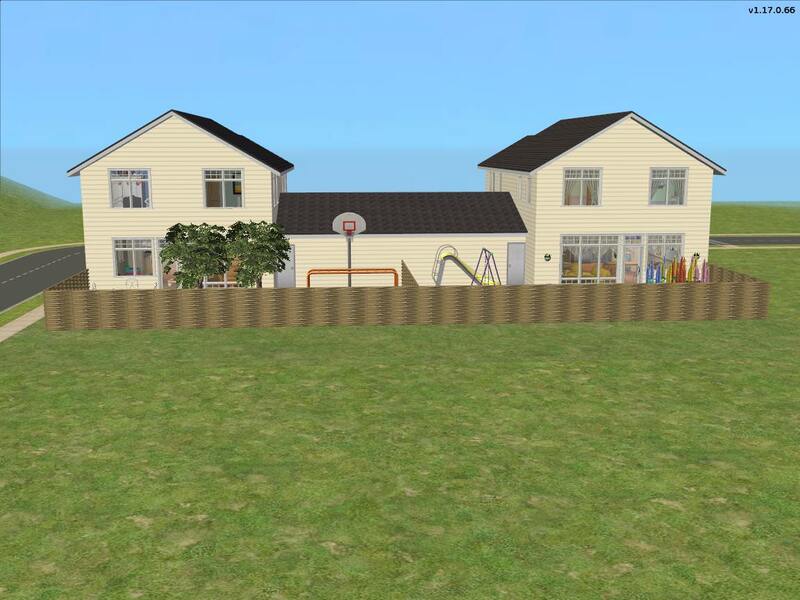 Both units are family-centered, one is for a family with young children, and one is for a family with older children and a dog. Both units have two entrances, one via the apartment door and one through the garage. 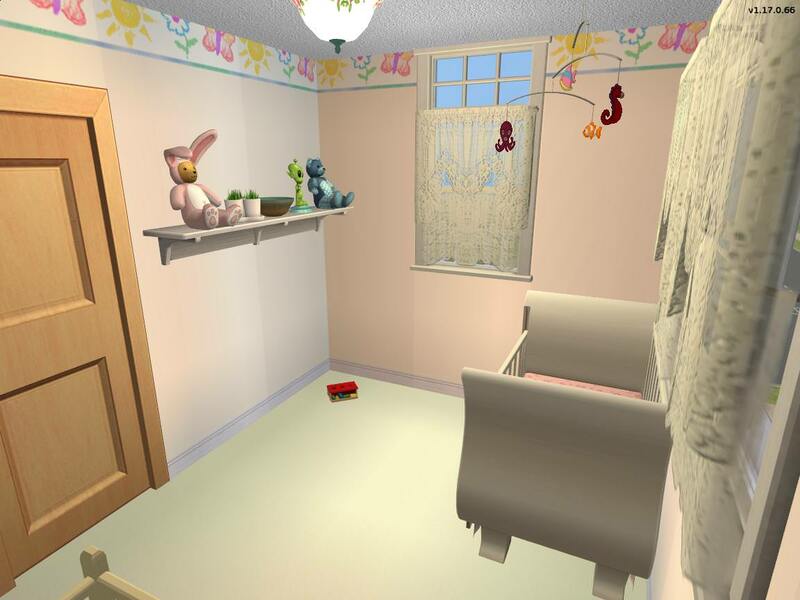 Normally the room leading from garage to apartment would be a laundry room, but since it's no CC I made the room to a sort of hallway where you can leave your outerwear. Visible is also my take on the garbage can. I am very fond of the garbage chute that came with AL since it permanently gets rid of trash without needing the garbage can that can be kicked over. The real garbage can is hidden under the garage roof where it's out of reach for angry neighbors (noticed in rent picture roof is too low to properly hide it but too lazy to fix it and re-do pictures xD). 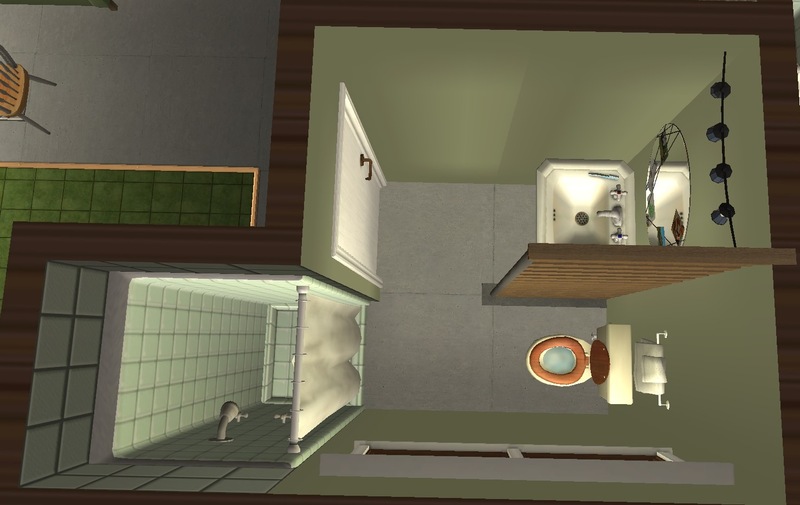 To give the lot a touch of realism I made the trash chute lead to a 1x1 square with a door from the outside, to make it look like there's a garbage can in there that can be accessed from the outside when the garbage truck comes to collect trash. Intended for a family with a child and a toddler. Colors are bright and cheerful, and plants are placed wherever the children may be as they believe it improves air quality. As parents are sports fans, or perhaps professional athletes, the house has sports paraphernalia in various spots. 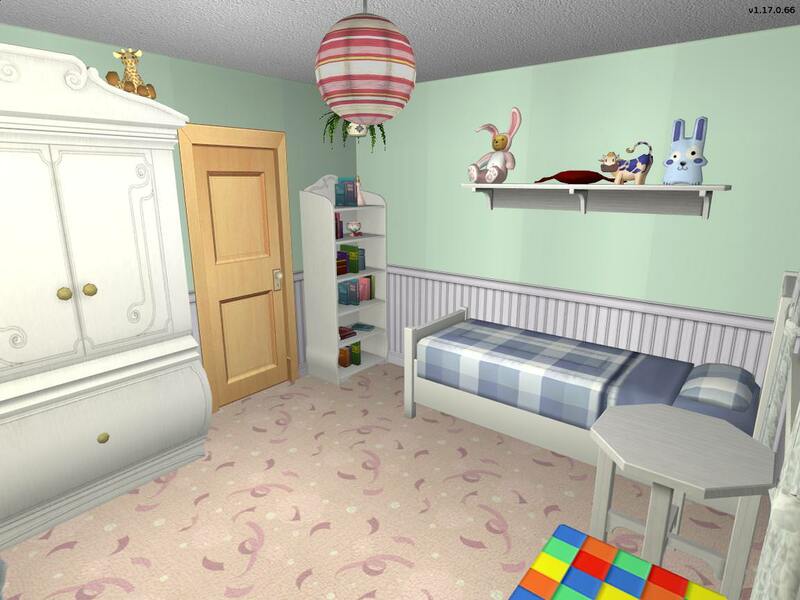 There's a changing table and two potted plants you can't see. 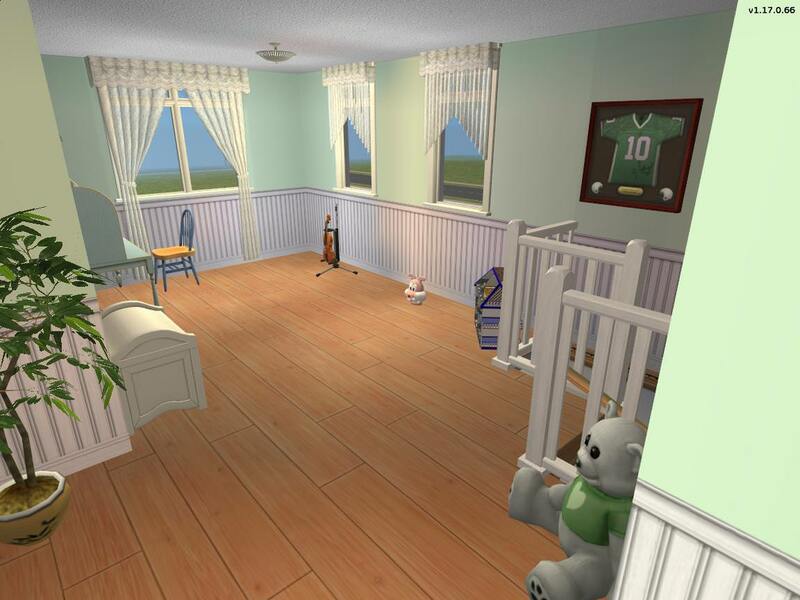 The bowl on the shelf is for storing dummies so they are close at hand if baby/toddler is upset (realism touch once again). For this unit I pictured a family with two children, a teenage girl and a child. I pictured the teenage girl as the social type, obsessed with appearances and gossiping with ones friends and constantly getting annoyed by their obnoxious little sibling and their childish behavior. The child I imagine as bright and cheerful and sort of over the top. The bowl by the door is for putting your keys or wallet in when you get home, so you don't lose them, and of course hooks to hang the dog leashes on. Basket ball court and monkey bars so that the kid can burn off some of the over-the-top energy. Complete with huge wardrobe full of clothes, the mandatory clothes on the floor, a mannequin to show off the latest cool purchase, a make up table for getting ready, and of course a comphy armchair next to the phone to sit in while talking on the phone with ones girlfriends. Backyard has some unused tile space. 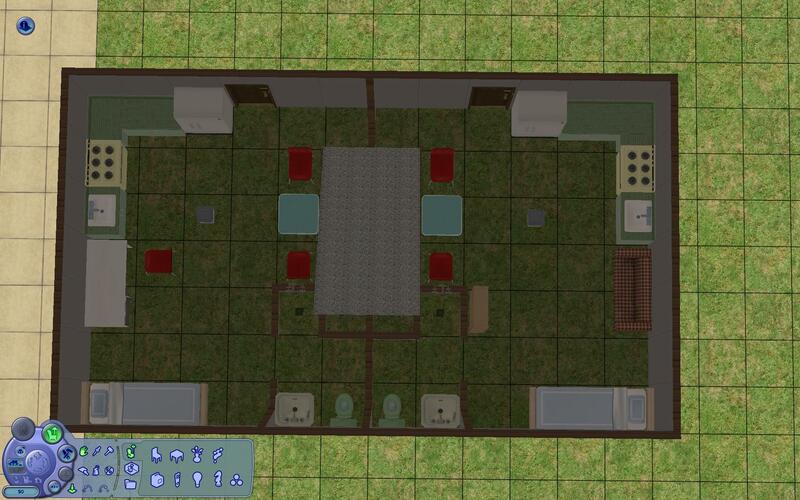 This is due to the lot size restrictions, man what I wouldn't give to be able to build lots with uneven number of tiles >_> I could have added trees or something to the back but I didn't want to restrict view to backyards more than it already is by the semi-high fence. 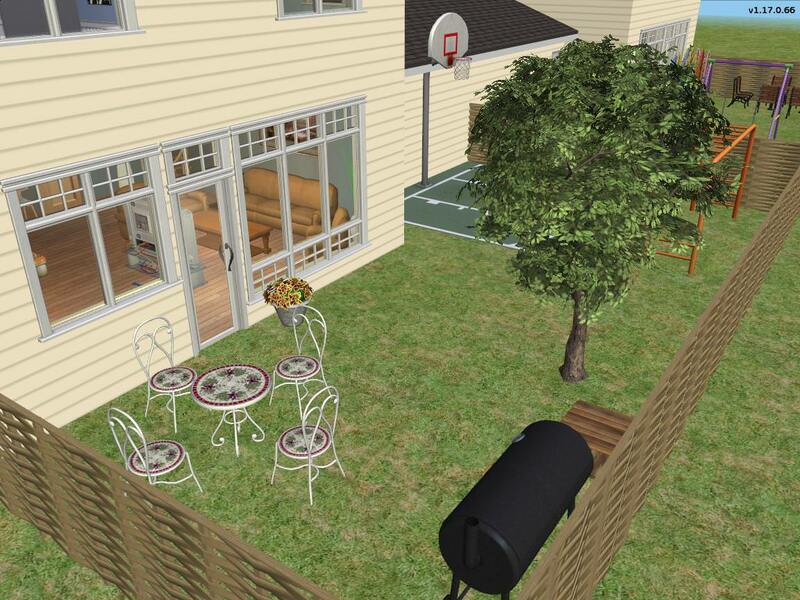 Could expand backyards a little without going over 6000 rent but I like the backyards as they are so I decided to leave it. I think I would call that a duplex in English. Well, I play-tested my lot with stage (not a stair landing) and had no problems at all, so I'll leave it as is (phew). 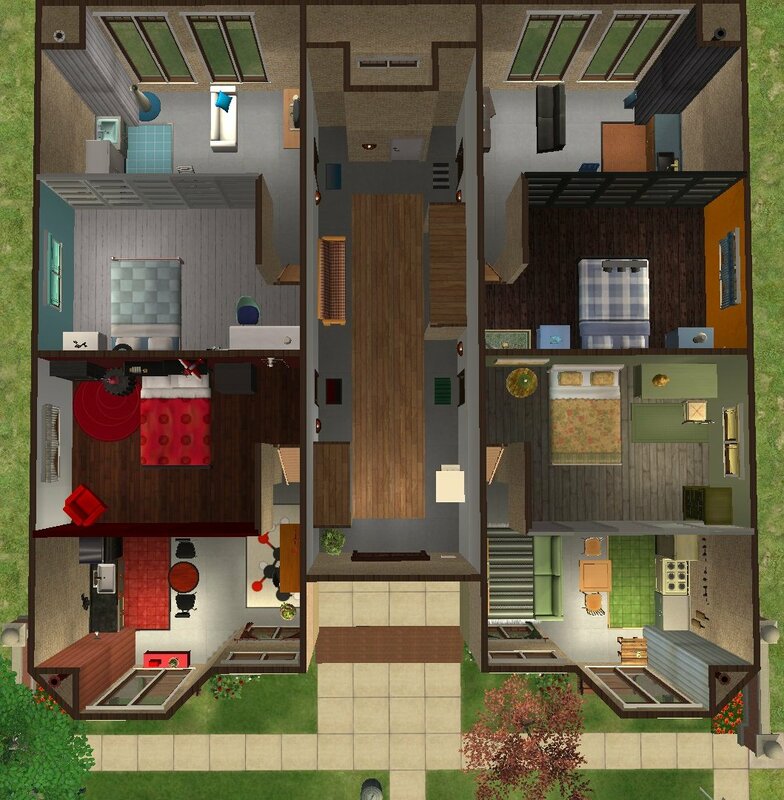 Well, I've happily been building my next lot but discover each apartment is over the budget. 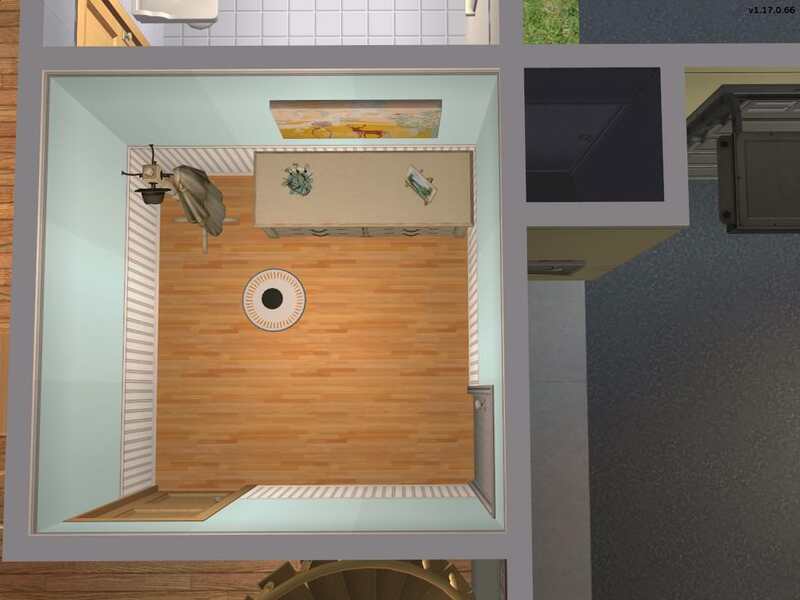 What affects the apartment price apart from kitchen/bathroom/walls/flooring? Does furniture and accessories, garden, etc? I tried changing stuff to the cheapest available but it made no difference to the price. Looks like I'm going to have to make the apartments really tiny which might affect playability. Communal bathrooms perhaps...? The cheapest one-bedroomed apartment was 1023. I managed to get it down to 1020. Sigh. yavannatw, I feel the struggle. I finally got mine below 1000 and if you remove a chunk of the square footage it really helps lower the rent after you have exhausted all the object price reductions. Yeah, square footage is the biggest thing to reduce when building cheap. It has a pretty steep rent increase, whereas objects are less steep. A tip is to make a copy of lot and re-zone once you get the shell complete, and see what rent is at for just the space itself with nothing in it. Helps give a pointer on if you need to reduce it, and how much leg room you have for the furniture. Well, I managed to get one apartment under 1,000 after shaving off some walls but the one beneath it is still over. Hmm. 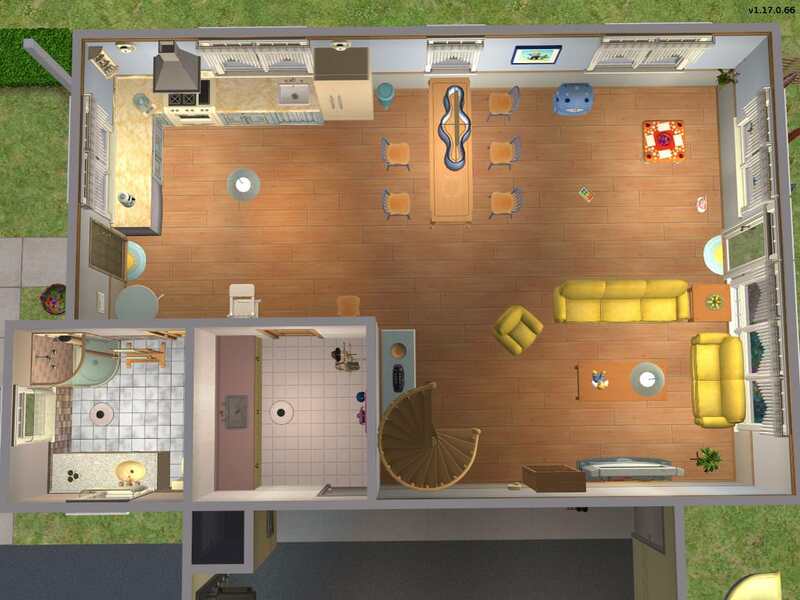 I figured I could make one of the other one-bedroomed into a two-bedroomed but I'll still need to make the apartments smaller. FYI - I'm about halfway through judging round 1, and I gotta say - you peeps are making this very difficult to judge! Every build is so unique! I love it though - so far you've all done amazing jobs. ...and I believe using the invisible ones (that I love!) would count as CC, right? So don't. I have got a question from a judge regarding the rug fix, as some of you had it in place when taking pictures. 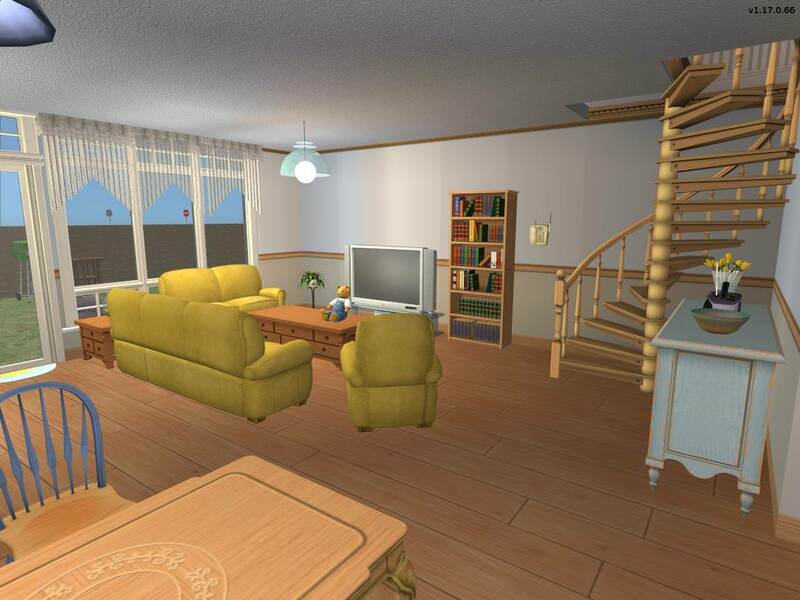 Tough one to call as default replacements for other objects aren't allowed but I have decided to let it slide, since it's only a visual fix for maxis content and sky boxes/water defaults are allowed. So if anyone avoided using it please note you are allowed to and won't lose points for it. I know I'm super early with this, but wanted to get it knocked out. I may edit based on Judges feedback from the townhouses when that is turned in. Small, affordable, and trendy, the Studio Lofts offer a an exciting place to dwell in the city. Each unit space contains a lofted bedroom area, 1 enclosed bathroom on the main floor, and the remainder of the rentable area combines entertainment, dining, and study. The building was originally a turn of the century newspaper offices of meager size - one of the 'independents' that eventually ran out of funds and closed shop. With the purchase of the property and resulting remodel, the Landlord left the cement flooring and a lot of the original brick walls as it saved on cost allowing for cheaper rent fares. They did cover up exposed piping with metal-cover shafting. What did get upgraded were hardwood floors in the lofts, plus new drywalls, which were primed and painted solid colors to attract the Hipsters, Bohemians, Punks, and all that rabble of youth. *Note about pics: I pushed the chairs in to show how they would look in a live-in space but pulled them out for play testing so they were usable. The lofted bedrooms share walls but are sound-proofed by objects. 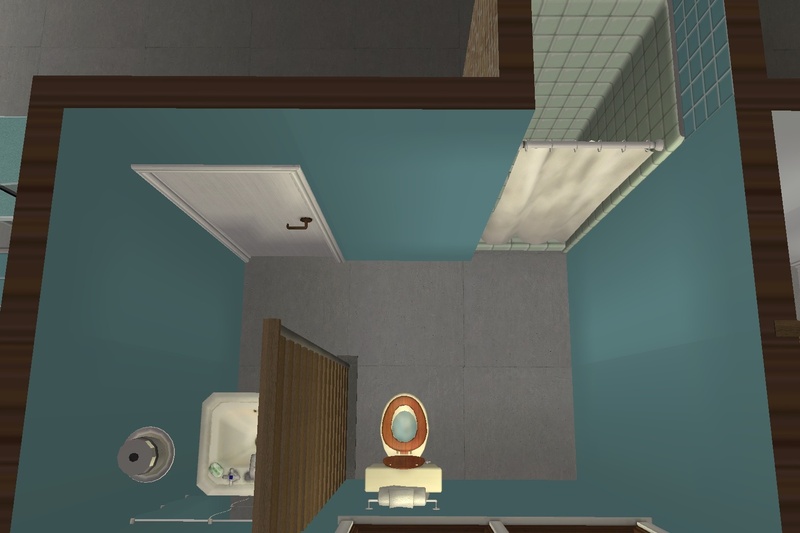 Fun fact: wall mirrors by themselves let noise through as in the Red unit, my test sim got awoken by noise coming through the mirror. I placed a light on the same space to fix that. This where residents can mingle, greet guests, pay rent, make public calls, drink self-serve cappuccino or hot chocolate. There is also an extra, public bathroom for whoever needs it at the back of the lobby. The lobby contains a security system that will contact law enforcement if broken into. This unit is decorated in a main theme of red with white and black accents. This unit does not have a TV but a chess set for entertainment. The bookshelf is located in the loft with a red reading chair. The resident plant buddy is a cactus underneath the front window. The lights in the is unit are mainly industrial bulbs that come from the wall. The desk is located in the main area across from the kitchen. The kitchen has hanging pots and decorative pans on the wall. 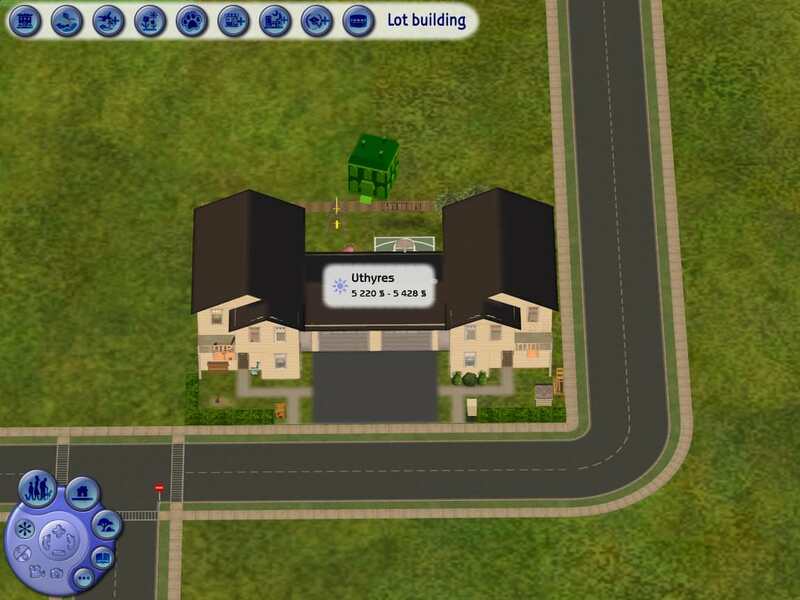 I imagine a bookish, logical-minded sim living here. One who finds more entertainment in learning and solving puzzles than mindless means of just consuming and not getting a skill out of it. This is why there is a chess set instead of a TV and the only loft with a bookshelf/reading area in it. Originally this was going to be a musician's apartment but alas, instruments are a bit expensive so the music corner I had envisioned was transformed into a reading nook. Now I imagine a trendy, fresh-faced graduate moving in and making a little temporary home of the space. A movie/lit buff, possibly a popularity or family sim who likes to get out on the town when they can but really just stay in with friends or family and have movie watching parties. This unit is decorated in a main theme of Green with beige and brown accents. This unit has a television and loveseat. The bookshelf is located next between the entrance and the entertainment area, against the wall of the ladder shaft. There is a dark green reading chair in the corner. The resident plant buddies are a pot of roses, a triple grass planter, and hanging fern. The desk is located in the loft on the far side of the bed next to the window. The lights in the is unit are mainly string lights. The kitchen has dried herbs and some cricket paddles which I think look like old bread peels. My idea for the sim that lives here is a plant-lover/nature enthusiast of any aspiration. They make sure their plants get all the light coming in from the tall windows. This is why there is a green motif and a lot of earth tones plus the multiple forms of plant life instead of the standard 1. There is even framed art for Three Lakes to emphasize natural beauty. This unit is decorated in a main theme of complimentary colors orange and blue (only half bad, right Cat?) with black accents. This unit has a television and two modular seats pushed together. The Bookshelf is located in the study nook next to the desk. The resident plant buddy is a hanging orange orchid right outside the bathroom entrance. The desk is located against the back wall of the study nook and has an extra shelf above it for placing trinkets and aquired knick-knacks. The lights in the is unit are mainly black track spotlights. The kitchen has hanging pots and decorative salt and pepper shakers in the corner. I imagine a pleasure sim living here, one that likes travelling and rather spends their hard earned money on that and going out then finding a permanent home for the time being. They have a penchant for oceanic places as evident by their bedroom posters and items, plus the fish tank. 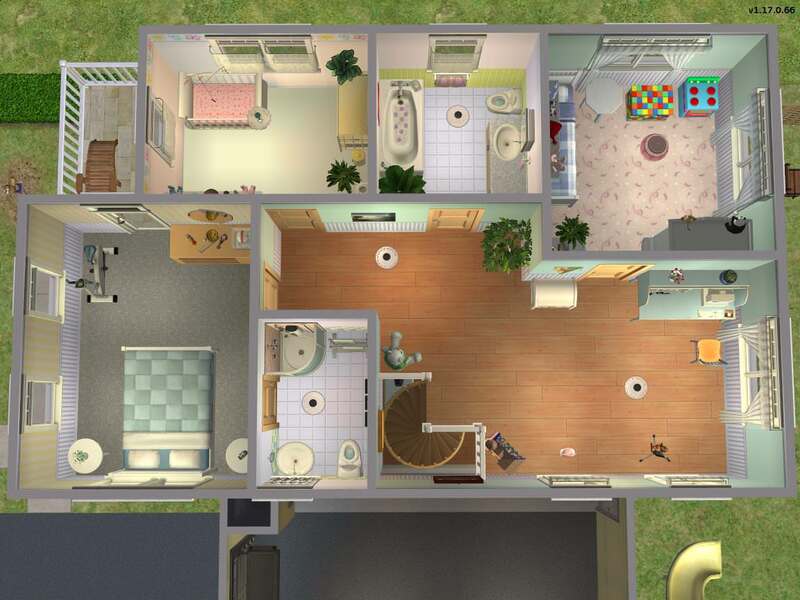 All apartments were play testing in multiple iterations with one sim. 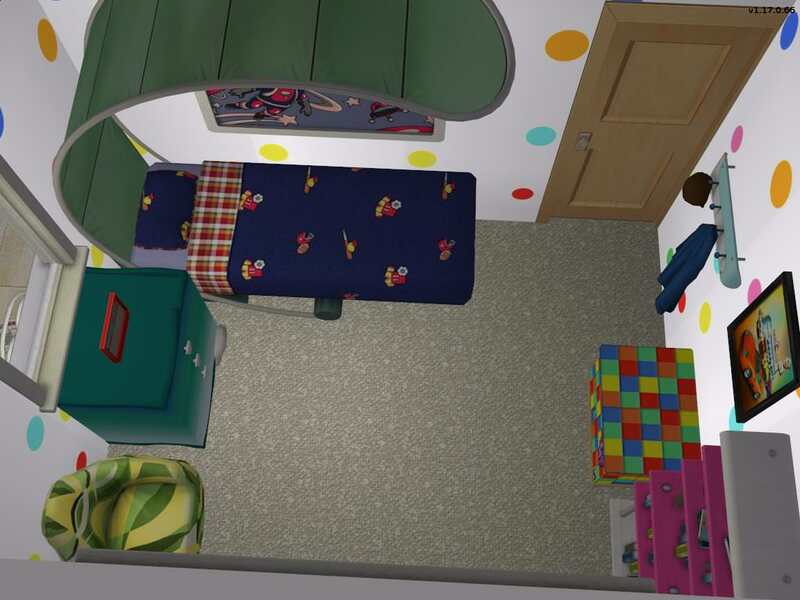 Testing for all chairs, both sides of the bed entries, dresser access, bathroom facilities, and of course, extensive testing of kitchen playability were conducted and tweaked to work for all units. As you can see, the kitchens in each unit have the great divide floor 'fencing' applied. As Gummi stated in her first post, using this to outline a floor will block off a section and that section will be considered 'common space.' I did this on purpose--because no matter how many items I ripped out items or exchanged for cheaper from my original decor, the price wouldn't budge below 1,000. 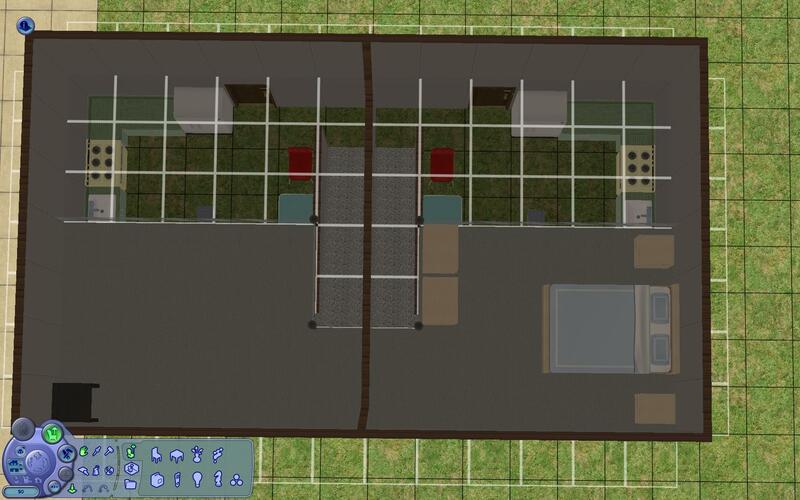 I got as low as 1,047 and then resented ripping out all of the personality I had put into decorating the units, so by dividing off the kitchens, that reduced 8 squares from each unit, dropping rent below 1000. Now, you may ask - does this affect playability? Yes, it certainly does but hear me out on this, as the change isn't negative, just different. The normal options you would expect a fridge to have are not all present on a fridge in common space, most notably the lack of snacks and TV dinners (so, anyone with a communal kitchen would have this same issue). 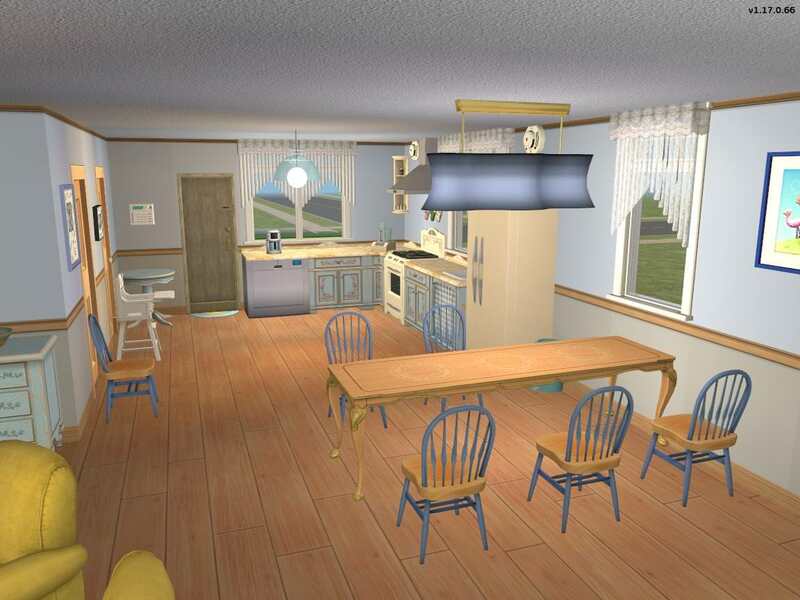 The sim can cross the divide as instructed, make a single plate or group plates as they wish under the limits of their cooking ability and feed themselves as normal. If selected to clean their plates, they will walk back across the divide and wash it in their sink. They can cook on the stove, clean the counters, etc. If instructed to save leftovers, they will put it in the same fridge and be able to retrieve it as well. When they are done making their meal, instead of automatically eating it, a sim must be told to eat it otherwise they leave it on the counter. If, for some reason they want snacks and all the regular fridge options, plus their want to buy a fridge filled, all they need to do is get a mini fridge and since there's already a fridge on the main floor, if they keep snacks in a mini fridge upstairs (there is room in each loft against the outward brick wall) - they will magically unlock all normal fridge actions from the main one in the kitchen. Otherwise they can just make plates of food for themselves and eat leftovers if they crave in-between quick meals. Like I said, it's a little different, but by no means impossible for a sim to feed themselves easily. 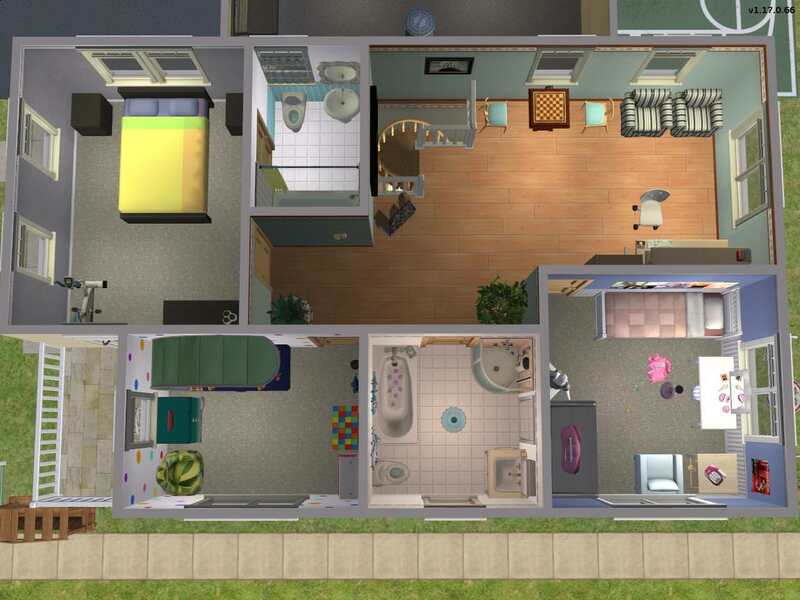 Since the divide is on the other side of the apartment, no random sims can wander in and use the kitchen publicly as they cannot cross the private area to get to it. I'm sorry everyone, I am suddenly having major issues with work and I am massively anxious about it all and I won't be able to participate in this contest any longer. I'm sorry that I didn't even manage a Round 1 entry! :-( It looks like a fabulous contest to be involved with and hopefully at some point I will be able to come and look at all the entries and tell you all how awesome you are! :-) Good luck to all of the contestants! @Charmful I love it - it looks way better than the mess I'm currently working on. Like you I've been pulling out all sorts of objects, losing any personality, just to get them cheaper. Still very much a work in progress, and a frustrating one at that. Just a question. 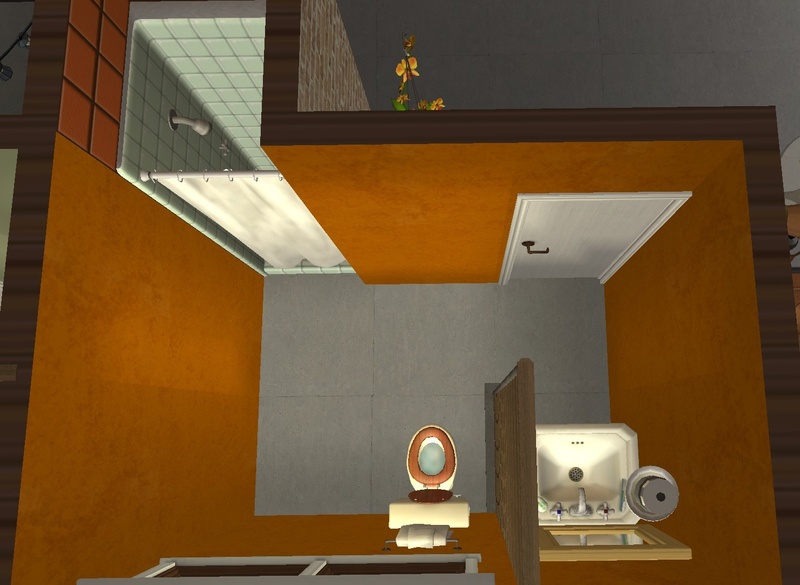 Did you playtest the trash chutes? 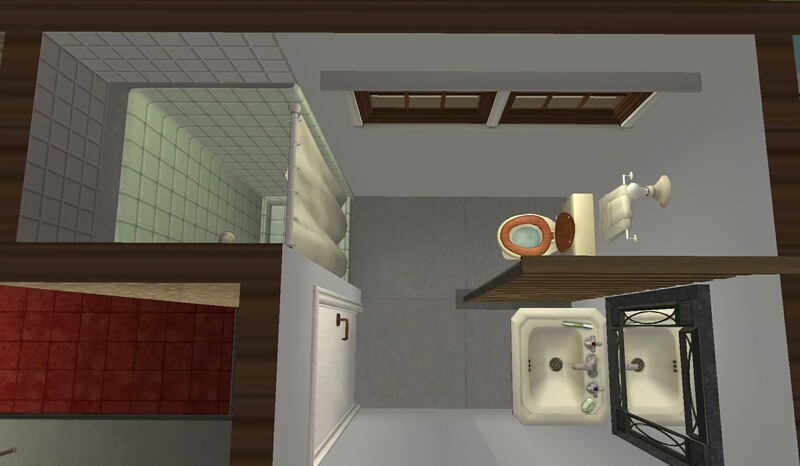 I once had an apartment where I placed the chutes inside and they disappeared when a Sim moved in. I had to place them outside the unit. Thanks! Yeah you gotta finagle a lot to try to keep rent low, hopefully you find a solution! 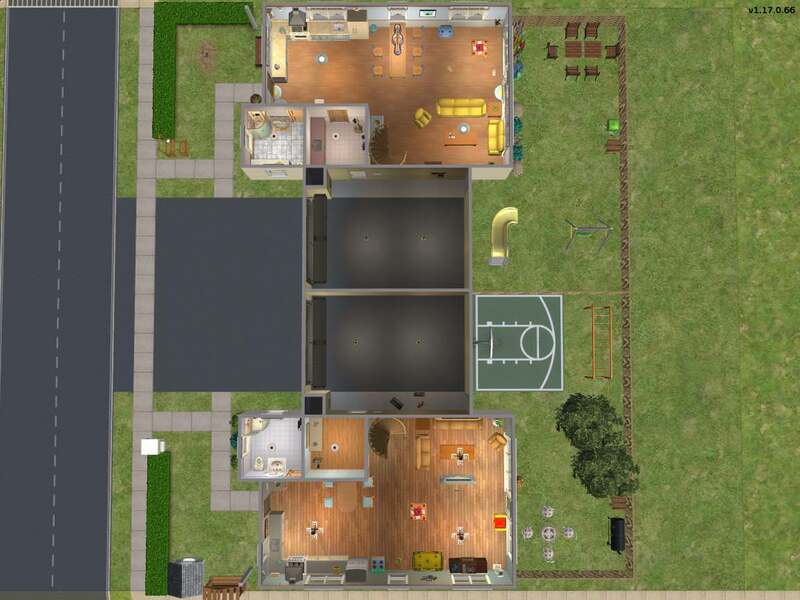 I tested them by having the play that sim recycle their newspapers and they worked. None disappeared after the move in. That's very of it did. 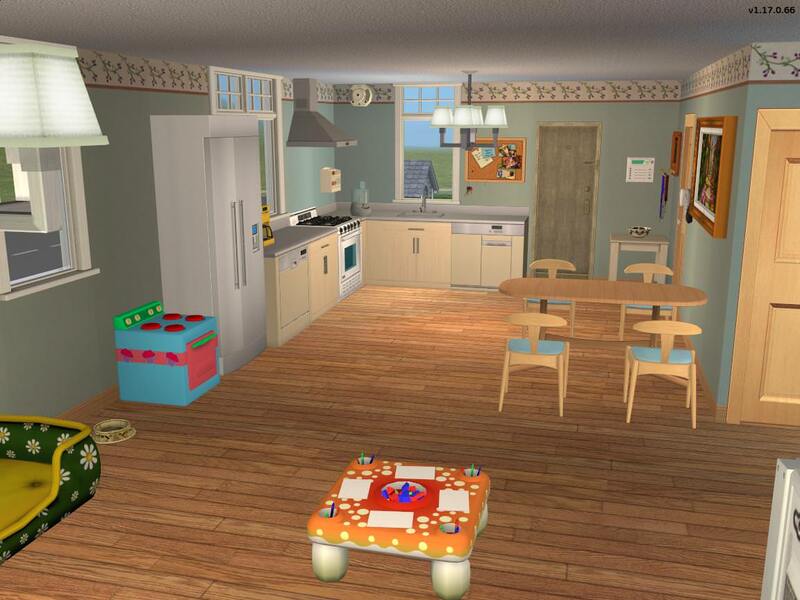 Charmful, how does the common area kitchen work with apthack? Since his hack will detect that there is no kitchen in the unit and thus won't keep the neighbors' hunger motives satisfied while they are in their apartments. 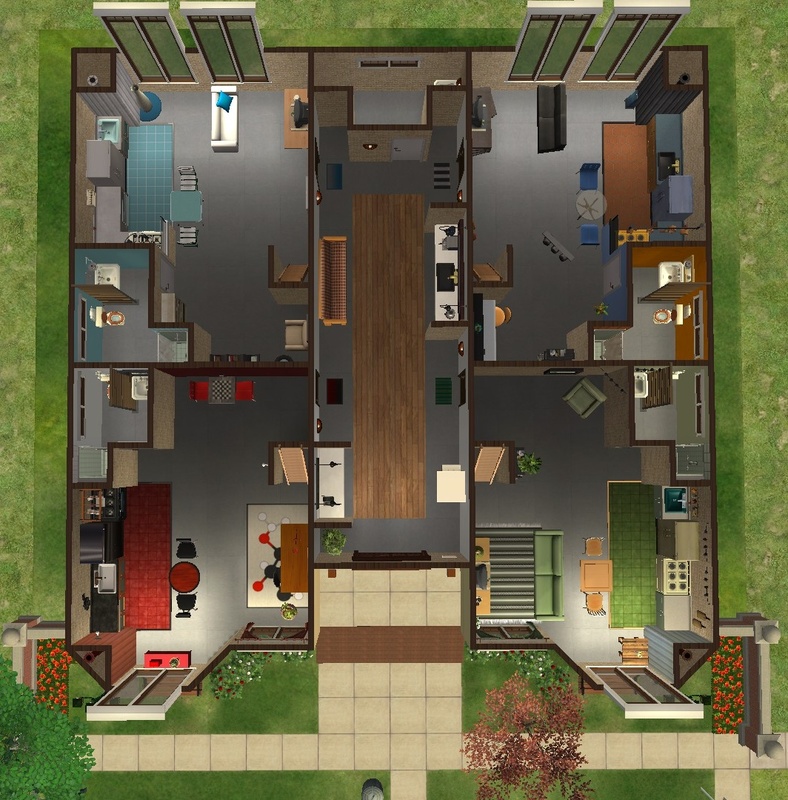 Do the neighbors use their own common area kitchens, or do they stand outside other people's apartments yelling that they cannot get to their (common area) kitchens? Well, that's weird, that my trash chutes disappeared when I had a Sim move in, so I played it safe and moved them outside the apartments. I haven't playtested yet. 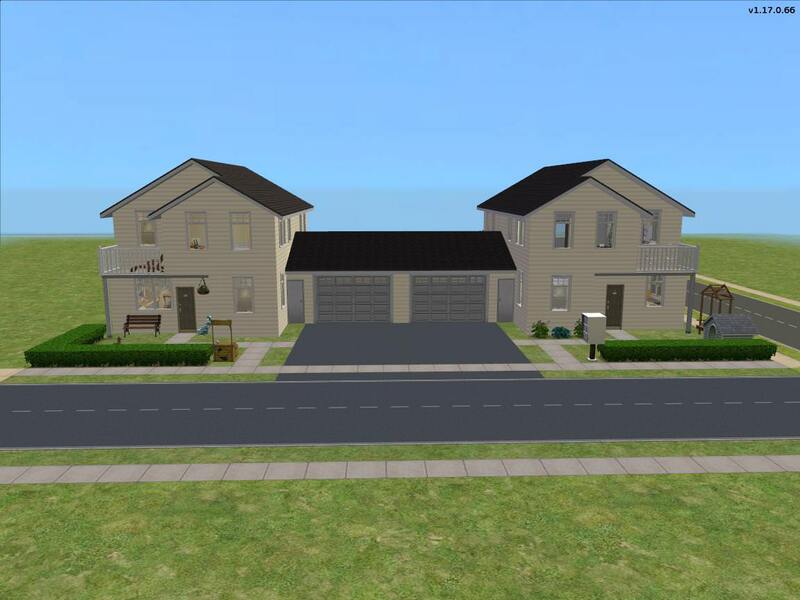 So I made some more changes to reduce the rent then exited to make a copy to change lot zoning. But.. (don't do what I did), instead of clicking on the move tool I clicked on the bulldozer and didn't register any warning at all. I only realised what I'd done when the lot didn't appear in the bin and the bulldozer was highlighted "No, no, no, no!" was my anguished cry. By some miracle there was still a copy from previous changes. But then I had to do the more recent changes all over again. Out of five units, two still need the rent reduced by 52 and 101, so I'm nearly there. Also, pardon my ignorance, but what is rug fix? I don't know, I don't have the apthack. I would hope they use their own kitchens as they have access to them. 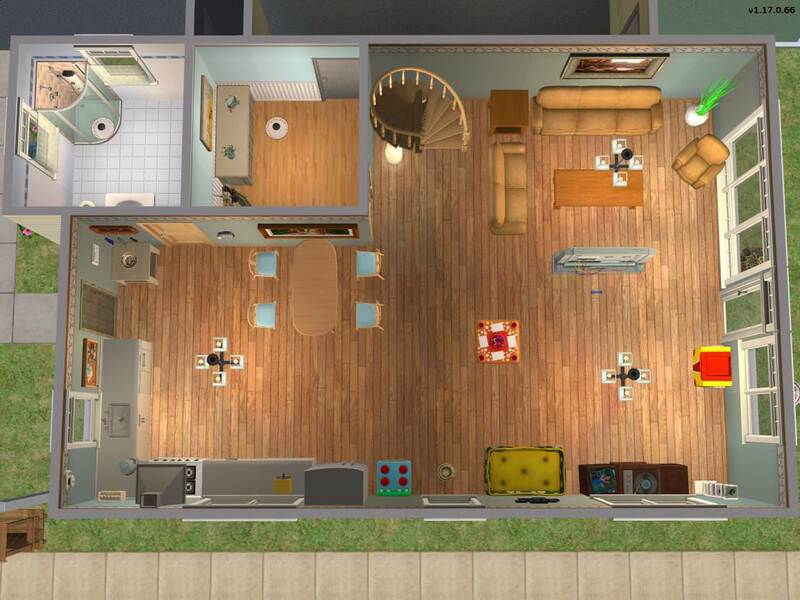 You can see the sim neighbors when they enter their kitchen. Since I don't have the hack, I don't see them eat but they admire some of the deco. They also don't stand outside my playtesting sim-occupied apartment whining for food. Also the rug fix is a mod that makes it so rugs don't look wonky if placed diagonally or off-grid. 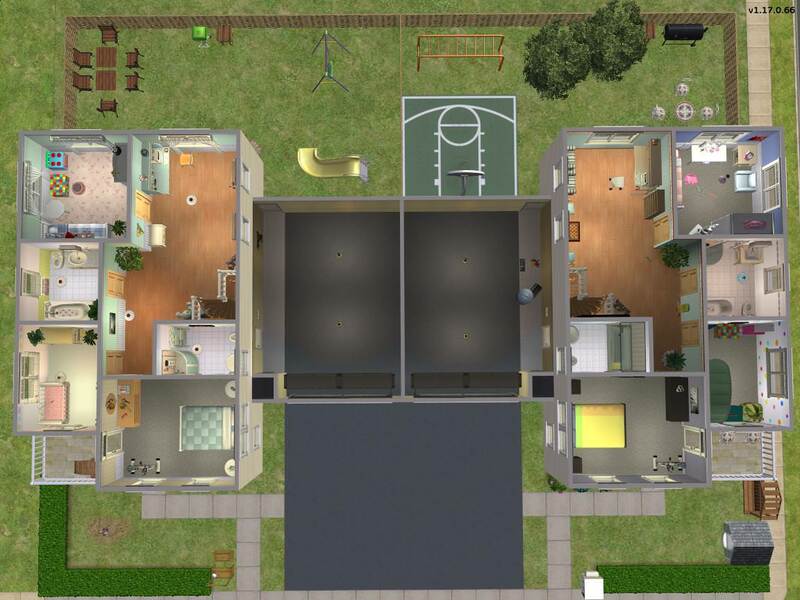 Charmful, I am not sure how you managed such wonderful (multi-level) apartments that came in under 1,000 simoleons, but hats off to you! 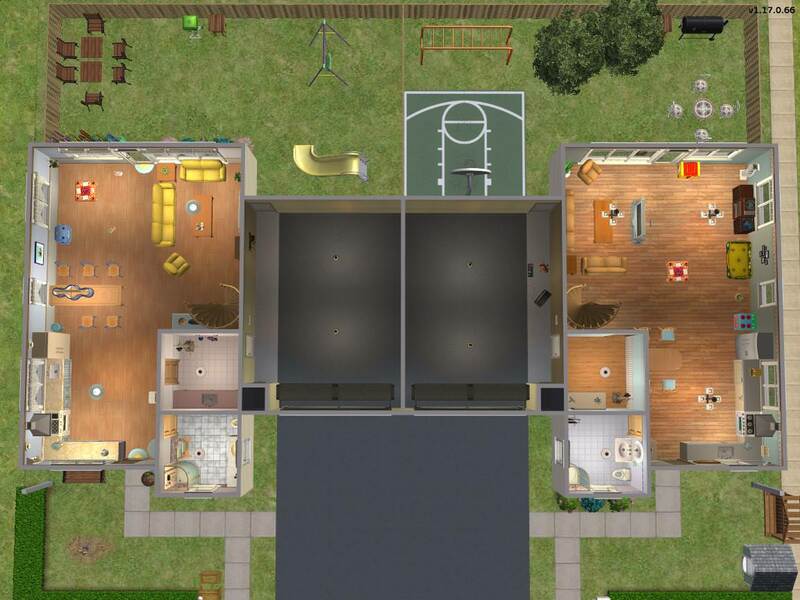 Can my sims move in? I had some time today to slap together my round 2 play-along, and figured I'd post a WIP. 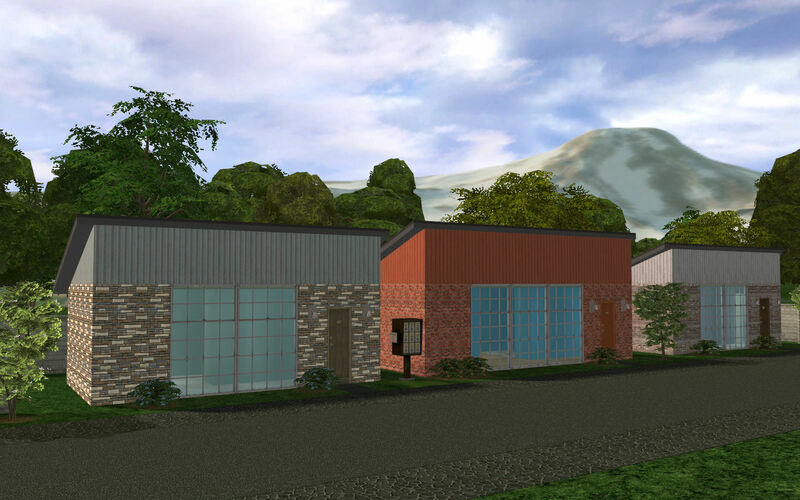 Still need to do the interior furnishings, but everything on the outside is Maxis or Maxis add-ons (window by Leefish and larger shrubs by Honeywell). The unit pricing thus far ranges from §553 - §769. I uh.. have this one here. I feel like such a dummy, I completely forgot I had it in. Whoops! Sorry! But thanks gummilutt for allowing it! Charmful, I love your lot! Those lofted ceilings really make the apartments feel huge! Really fantastic job! In order to save space, since a sink is not (by Sims standards) an essential part of a bathroom, can we have a 2x2 bathroom with just a shower and a toilet or will we be deducted points, even if there's a sink in the kitchen? Honestly - I would deduct points. Not having a sink in the bathroom is gross. A phone, fire alarm with a stove/fireplace/grill, and a garbage can are also necessary IM-judgy-HO. @gummilutt, question about "bedrooms." I have some units that I want to be loft style (see pictures attached) and I'm staging them to have two bedroom areas, but there are no actual walls around the bedrooms, so I'm unsure of how to price the unit. The unit is just above $1,000 to $1,200 and I don't know if this is okay. Since there are two beds would the unit be considered a two bedroom, making the limit $2,000 or should I be using the $1,000 limit because there are no walls, making it a studio? It would pass for host bonus rent point, but whether or not it meets the requirements for the round is up to the judges to decide. Does it meet the spirit of the challenge set? Guess I'll have to rework my bathroom. 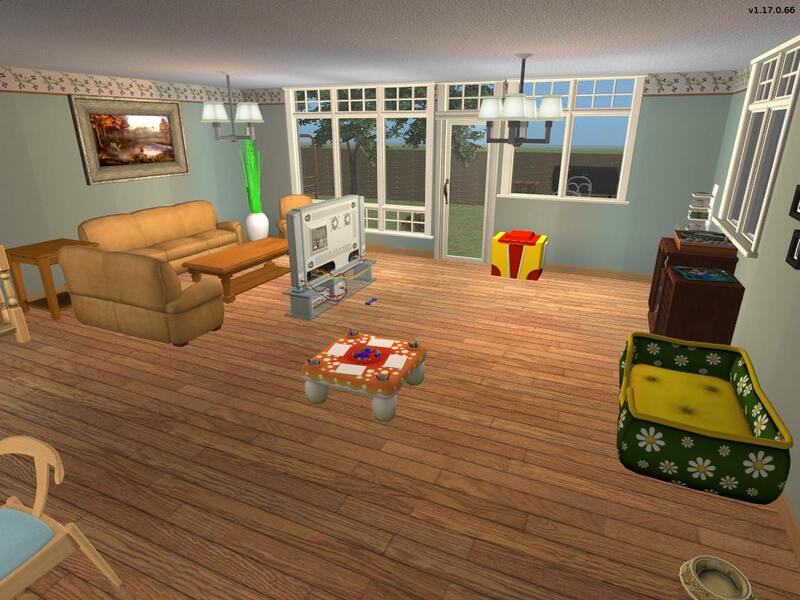 Bummer, I was happy with how the apartment turned out. #225 9th Jul 2018 at 2:31 PM Last edited by Karen Lorraine : 9th Jul 2018 at 3:54 PM. @Yvelotic2001 Hang on, you can get a 2x2 bathroom to work with shower, toilet and sink, lemme find you a picture, cos I've done it!